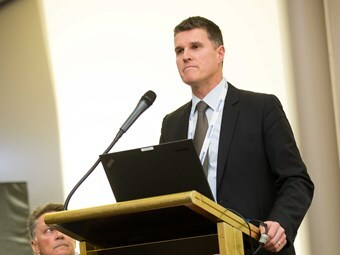 The future of the BusVic Maintenance Conference and Bus Expo may be uncertain but operators and suppliers still turned out support the annual Melbourne event. The conference was held for the 60th time this month as the association celebrates 70 years of service this year. About 600 people attended the conference while 400 people attended the Victorian Industry Gala Sit-down Dinner. There were also 25 heritage buses on display throughout the two-day event while 60 exhibitors showcased their products and services. BusVic Executive Director Chris Lowe describes the event as "magnificent" and says this was most likely the last event to be held at the Moonee Valley Racing Club. The event in 2015 will be held at Jeff’s Shed – the Melbourne Convention and Exhibition Centre – but plans beyond that year are still uncertain. "We weren’t sure what the event was going to produce this year… but it’s come together beautifully," he says. "We’ve risen to the challenge and I have no doubt we’ll evolve as we continue to work with our stakeholder friends. "It’s not about quantity but quality." Lowe also presented the associations policy document Moving People Victoria – in line with associations around the country. The document includes BusVic’s vision for SmartBus and will be presented to Victorian and Federal MPs. The association’s annual awards were also presented throughout the event. Apprentice of the Year awards were given to Shane White, of Ventura Bus Lines, and Daniel Higginson, of Moonee Valley Bus Lines. Industry Achiever Awards were given to Ron Hamilton, of Ventura, and the Trotters Joint Venture. Industry Contribution Awards were also given to Stuart Dawson and John Teare.